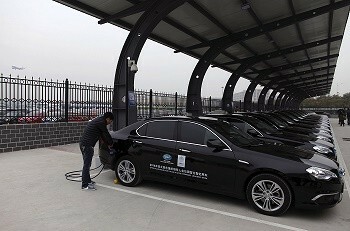 Several Chinese car manufacturers are set to launch connected cars at the Shanghai auto show which will start on April 20, the autonewschina.com reported. Xu Heyi, chairman of the Beijing Automotive Industry Holding Co. (BAIC), said that his company will present a midsize electric sedan at the auto show. BAIC did not provide details about the car, which was jointly developed by BAIC and Leshi Internet Information & Technology Co., a Beijing-based manufacturer of Web-enabled TVs, the report said. According to the report, two other state-owned automakers are also expected to present their versions of the connected vehicle concept cars at the event. Chery Automobile Co., which has teamed up with two local companies--Pateo Corp. and Yongche, Inc.--will also build electric vehicles. Under their venture plans, the three companies will launch their "smart" electric cars in 2016. The report said that Pateo launched the iVoka connectivity system for passenger vehicles, while Yongche introduced a car-sharing service using smartphone apps and social networks. Chery unveiled its concept electric vehicle (EV) dubbed @ANT2.0, which could be shared by motorists via the Internet during an auto show in Shanghai in 2013. Yin Tongyao, Chery chairman, said that its partnership with Pateo and Yongche will turn their concept into reality.